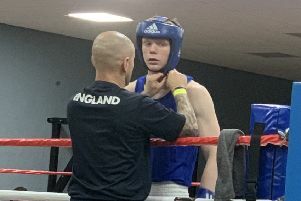 Luton boxer Sam King was triumphant at the Hull Box Cup on Sunday. The 14-year-old attended the competition which is an ABA tournament that attracts hundreds of boxers from around the world. In the final on Sunday, King took on Peter O’Hagen from County Derry in Ireland. The teenager boxed beautifully against his opponent whose record coming into the contest was 26 wins from 33 bouts. King, who has previously boxed for The Academy and Lewsey ABC, before heading to Hoddesdon BC, won the first round convincingly. He then stopped his opponent in the second with a fierce right hook to ensure he was victorious.